Some firms say billboards are worth the expense, while others say such signage isn’t for everyone. “It’s hard to calculate exactly what kind of returns we’re getting (on billboards), but the customer feedback we get says they are influential,” said Aaron Zeitlin, a spokesman for Greenside Recreational, a marijuana retailer in Washington state with stores in Seattle and Des Moines. Others are less convinced billboards are worth the expense. “Those that have billboards tend to have high revenue because billboards are so expensive and lower-revenue stores can’t afford them,” said James Lathrop, owner of Cannabis City, the first recreational marijuana store in Seattle. Cannabis City has advertised on billboards since 2014, but in October the company declined for the first time to renew its contract. “Billboards are really expensive with limited returns,” Lathrop said. However, other state-legal marijuana companies have found billboards to be a headline-grabbing and popular mode of advertising – even if they must tread carefully with the messages they put on their signs. New England Treatment Access, for example, launched a billboard campaign in October. 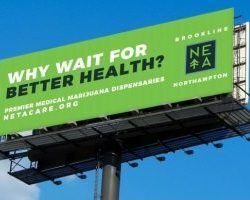 The Massachusetts medical cannabis dispensary bought two billboards close to Boston’s border with the affluent town of Brookline and two others on the Massachusetts Turnpike, about 20 miles from a second location. Using black and white letters on a bright green background, the billboards simply ask a question – “Why Wait For Better Health?” – over the tagline “Premier Medical Marijuana Dispensaries.” The signs also include the company’s two locations, website address and logo. “This is educational,” company spokesman Norton Arbelaez told The Boston Globe. Illinois-based Cresco Labs took a stab in 2015 with a $1 million advertising campaign that included billboards and tested the state’s advertising restrictions. Cresco said the messages didn’t advertise a business or medical cannabis but, rather, educated the public about MMJ as a treatment option for illnesses. This year, the company’s Pennsylvania subsidiary – Cresco Yeltrah – made waves when it announced a roughly $500,000 advertising campaign that includes billboards. The signs carry Cresco’s name but don’t encourage patients to buy the company’s products. According to the Outside Advertising Association of America, billboard advertising should produce big profits. For every $1 spent on “outside of home” advertising, about $5.97 in sales are generated, the industry group says. Lathrop’s experience with Cannabis City contradicts that claim. When he bought the building in which he planned to open Cannabis City in 2014, it was “ugly” and “dull,” Lathrop said, the kind of place that was easy for passers-by to miss. But he wanted to be the first rec store to open in Seattle, and redesigning the building in a thoughtful way would’ve taken too much time and allowed competitors to open first – which he didn’t want to let happen. So, instead of investing in a redesign, he paid for billboard space across the street from his business. “My intention was to bring attention to a store that otherwise would not be noticed,” he said. But at an estimated $8,900 per month – $5,400 for one side of the billboard and $3,500 for the other – Lathrop saw it as an expensive marketing investment. What made it worse, he added, was that while most traditional companies can deduct such investments from their taxes, marijuana businesses are prevented from doing so by the 280E provision of the federal code. Lathrop initially stuck with the billboard because it didn’t take long for several new marijuana retailers to move into his neighborhood, including one that also bought billboard space and – according to consumers and other business owners – was attracting customers because of it. He ditched the billboard in 2015 and found a new company that offered him six signs for $1,000 apiece. Lathrop advertised that way for a year, then cut back to two billboards at $2,000 a month. Not being able to take the tax deduction made it impossible to justify the expense, so when it came time to renew the billboard contract in October, Lathrop passed. Other marijuana companies believe their billboard investments have paid off in some form, however. Take Greenside Recreational, which bought its first billboard space in 2014 to get out its name. The company started with four billboards but now has only two. The annual cost for both is $75,000-$150,000, said Zeitlin, the Greenside Recreational spokesman. Does the investment pay off? But when Greenside employees ask customers how they heard about the store, a common response is the billboards. Weedmaps – a California-based marijuana tech company – has 416 billboards in 10 states and Washington DC as well as 55 in Canada. Nowadays, Weedmaps’ billboard strategy focuses on education and advocacy with its “Weedfacts” campaign. “The goal of the campaign is to provide communities with credible, verifiable facts about the benefits of legal marijuana and spark an informed, respectful discussion among residents, community leaders and elected officials,” Fillichio wrote in an email to Marijuana Business Daily. Billboards can be a great way to get your message out there but any sized dispensary can reap large returns through text message marketing. 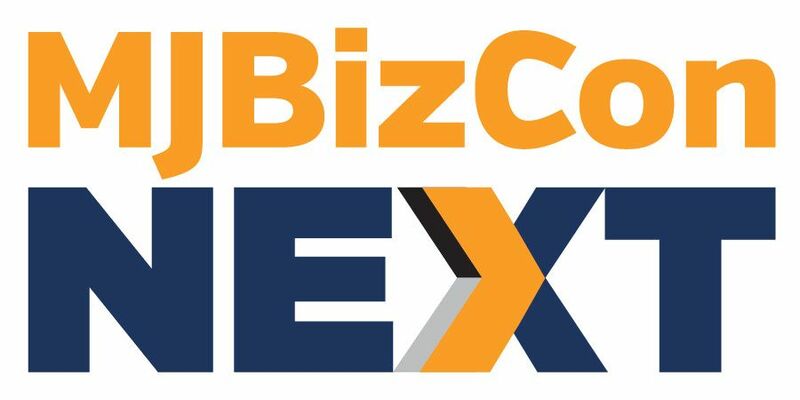 A Text Blast brings on average at least 10 to 50 incremental customers per 1000 messages sent. Text messaging pays for itself easily 10 times over. The foundation to building any brand/ business is driving awareness and relevance with your target customer. Remaining top-of-mind to your patient/ consumer base is critical to success. Out-of-Home advertising is one of the few media forms available to cannabis companies to do this. The benefit is a constant presence for those who pass it daily and those who share via word-of-mouth. Using OOH to notify the public that medical cannabis is legal in their state, is strategically wise. Most states do not publish this broadly, if at all. It’s incredibly misleading to quote the outdoor advertising association’s suggested spend to sales numbers, as a basis for what cannabis companies could expect. Those numbers are built off mainstream industries that most likely have broad distribution/ multiple outlets along with access to other media forms without restrictions. Not at all applicable here. As more cannabis companies look for how they can break through the clutter, it’s important to remember that delivering on the service or experience you sell the consumer, is what propels your business growth. If they fail there….ROI will always look bad.